Overview: The Mighty Mite of Ivy Town returns in the second volume of Showcase Presents The Atom. Scientist Ray Palmer discovered a way to miniaturize himself using a white dwarf star and ultra-violet rays. 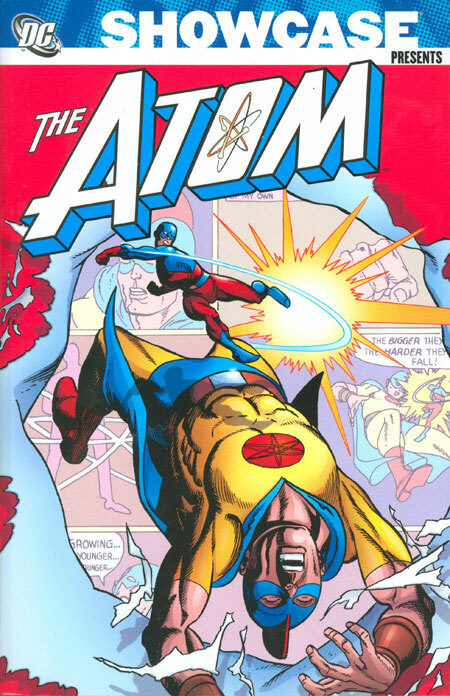 Donning a costume, Ray Palmer adopts the identity of the Atom, who can shrink and enlarge himself, as well as adjusting his weight for emphasis when needed. In addition to fighting the various costumed foes that threaten Ivy Town, the Atom also takes a dive into the time pool, when he is able to travel to events in the past. The stories follow the same formula from the previous volume, where we either get one full-length story or two shorter stories per issue. The highlights of this volume is Ray Palmer meeting his Golden Age counterpart in Al Pratt, the Earth-2 Atom. The two Atoms actually had their first meetings in the first and second meetings of the Justice League and the Justice Society. But this volume features two issues, #29 and #36, that brings the two pint-size heroes together. Why should these stories be Showcased? : As we move further and further away from the Golden Age and Silver Age of comics, we start to overlook some of the great people that worked on those books. Case in point, I would like to speak about editor Julie Schwartz. He came of age in the 1930s as a science fiction editor, helping writers to place stories in magazines. In 1944, he joined All-American Comics (one of the companies that would become DC Comics) as an editor. During his tenure, he brought in numerous science fiction authors to write comics. Schwartz oversaw the “Silver Age” debut of new versions of the Flash, Green Lantern, Hawkman, and the Atom. In the mid-1960s, he took over the editor reigns for the Batman books, overseeing that revitalization of that franchise. In the early 1970s, he did that again with the Superman family of books. What makes the Schwartz books stand out, particularly on titles like The Flash or The Atom, is that the stories were based in science, not just in fiction. The characters were scientists in their civilian lives. I know as a kid, I learned actual knowledge reading some of these comics. So yes, all Julie Schwartz edited books should be showcased, and The Atom is a great place to start! Footnotes: The Atom #31 is also reprinted in Showcase Presents Hawkman Vol. 2. The Atom #38 was the final issue with Ray Palmer as the solo feature of the title. Beginning with issue #39, the title was renamed The Atom and Hawkman, as Hawkman’s title had just been canceled. The Atom and Hawkman ran for seven issues before it was canceled as well. Parts of those seven issues can be found in Showcase Presents Hawkman Vol. 2. Excuse me for a moment while I get very angry with DC Comics. See, for The Atom and Hawkman #40, #41, #43, and #44, the two title characters have separate stories. However, Showcase Presents Hawkman Vol. 2 only reprints the Hawkman stories from those issues. That means that the Atom stories from issues #40, #41, #43, and #44 have not been reprinted! These were 10-12 page stories, so that would have meant 40-50 to include those four Atom stories, either in the Hawkman Showcase or this Atom Showcase. If you like this volume, try: the All-New Atom series that debuted in 2006 from Gail Simone and John Byrne. In this series, we meet Ryan Choi, an Asian-American protege of Ray Palmer. Choi has recently moved to Ivy Town in hopes of taking Ray Palmer’s position at the university. Discovering some of Palmer’s notes, Choi tracks down one of the old size-changing belts used by the Atom. Developing a new costume, Choi takes on the name of the Atom, to further fill the void of Ray Palmer’s absence from Ivy Town. This series ran for 25 issues, and almost all of the series has been collected into four trade paperbacks. Choi was a fresh character that truly paid homage to the Atom of the 1960s, where the science was just as important as the fiction. Sadly, Choi was not brought into the “New 52” universe, so tracking down this series is your best bet to discover the character. Great job Jerry. There were a lot of nuggets of science in those volumes which really did make the silver age special. Those comics got me into sci fi which brought me into science! Thanks Julie Schwartz! Pingback: Throwback Thursday – Showcase Presents The Atom Vol. 2 – WORST. COMIC. PODCAST. EVER!